Tony: Special Agent Fornell! Look at that. Your hair grew back, almost. 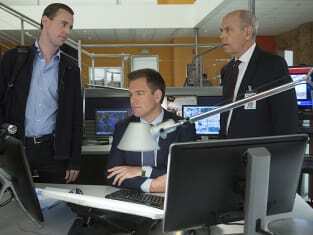 Fornell: You see, this is why you're my least favorite, DiNozzo. [Glances at McGee] Scratch that. Second least favorite. Gibbs! New look! What's next, skinny jeans? Permalink: Gibbs! New look! What's next, skinny jeans? George: We going to talk about the gold elephant in the room? You're still wearing your ring. Does that mean you want to try and work it out? Bishop: Marriage isn't something you just give up on. Those vows meant something to me. George: You weren't the one who broke them. Permalink: You weren't the one who broke them. Tony: Name of the boat is crucial. I had mine picked out for years. Go ahead, you'll never guess. Tony: We've been working together too long. Permalink: We've been working together too long. Gibbs: What do you need? Bishop: For everyone to stop treating me like I'm this fragile thing that's about to break. Gibbs: How many times a week did you check on me after Iraq? You kept showing up, even after I said I was fine. Bishop: That's different, Gibbs. You almost died. We were all worried. Gibbs: So's your family. They just want to make it better. Bishop: I've been so inundated with everyone's opinions on how I should feel and what I should do, I haven't actually been able to process it myself. Gibbs: You can't do that if you won't talk about it. Permalink: You can't do that if you won't talk about it. Bishop: Well. You are telling me to talk about my feelings? All right. Tell me Gibbs, how have you processed getting shot? Who is it you're opening up to? Gibbs: Dr. Taft. I've been talking with him since the Sudan case. Everyone reaches a point, Bishop. Even me. You just got to take the first step. Gibbs: Rule #28. When you need help, ask. Permalink: Rule #28. When you need help, ask. Bishop: You can change the future. Yours and Alex Quinn's. A soldier who fought bravely for his country and is fighting for his life. A life that you can save. You once took an oath to never leave a fallen soldier behind. Now's your chance to make good on that promise. Doogan: The deal was my only shot at getting out of here. I just wanted a fresh start. Bishop: That's exactly what this is. A new beginning. I know. Don't let a bad situation define who you are. Fornell: All right, this is too pathetic. Grab your stuff, let's go. Tony: You're inviting me to your house for Thanksgiving dinner? I thought I was your second-least favorite? Fornell: You are. But dry turkey, blackened dinner rolls....it's really more of a punishment. Tony: So now that we're friends, can I call you Toby? Fornell: Don't push your luck. Permalink: Don't push your luck. Barbara: My daughter doesn't open up to many people, Gibbs. So I guess if she trust you, I should too. It is not easy knowing she's hundreds of miles away working in a dangerous job. If I had my way, she'd live here and be a teacher. Or a nun. Barbara: That being said, it is very comforting to know she's surrounded by people who care about her. Gibbs: I'll look after her. Barbara: I'm counting on that. Permalink: I'm counting on that.